A View of New York in 1876. 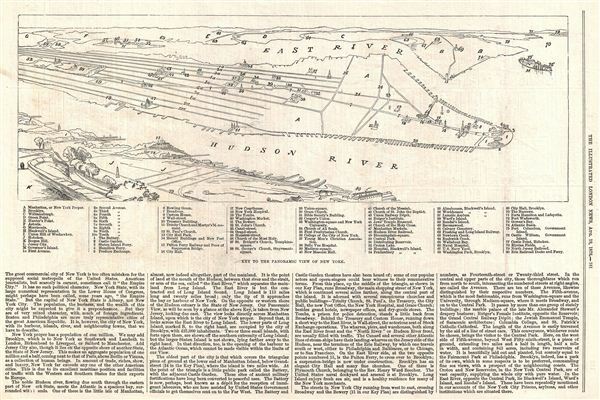 A pleasant, simplified view of New York City in 1876, with important buildings numbered and named in the key. After lamenting that New York is not really very American, 'with much of foreign ingredients,' the London News writer goes on to sigh 'It is, however, the city of New York...that we have to describe.' The view includes Hoboken in foreground, Manhattan in the middle ground, and Brooklyn in the background. Fascinating text sales ads appear on verso. Published in the August 19, 1876 issue of the London Illustrated News. The Illustrated London News, August 19, 1876.